Stanley, ID. Forest fire season in Idaho used to be August and September with many years with no forest fires of note. Now the fires begin in mid-July and burn until mid-October. Like last year, fires have already broken out, such as the Road 210 fire near scenic Stanley, Idaho, and a half dozen larger fires are burning in the deep backcountry and Wilderness of central Idaho. Earlier we wrote an article that outdoor enthusiasts need to consider the month of June much more importantly than in the past because of the trend toward summer long fires. Stanley is a tourist town, and the scenic views of the jagged Sawtooth Mountains an annual draw of Idahoans and national tourists too. This year the fire season began at Redfish Lake near one of the most photographed sites in Idaho, the Sawtooths from the south shore of Redfish Lake. Campers were quickly evacuated. The fire almost burned down the Sawtooth Fish Hatchery which is critical to salmon recovery. (See Idaho Statesman article on the fire scattering tourists). The fire is nearing control, but negative information may be keeping visitors at bay for the time being, although people can check air quality using the Sawtooth webcam. Today, July 25, air quality seems excellent, and it shows only one day in the last ten with real smoke. Other fires have broken out to the SW at the southern tip of the Sawtooth Wilderness (Leggit Creek fire) and NE near where the massive Halstead Fire burned last summer from July 27 to mid-October (almost 190,000 acres in its perimeter). Farther north, in and near, the huge Frank Church Wilderness (the Frank) burn the big fires. They are Idaho’s presently largest fire, the Papoose (9000 acres) on the upper slopes of the Impassible Canyon of the Middle Fork of the Salmon, the Ridge Fire burns near Red Mountain, the Thunder City Fire along the west boundary of the Frank, the Gold Pan fire in the Wilderness near the Magruder Corridor road, the Rough Creek Fire in the Salmon River Canyon (just contained), and the Lodgepole Fire just SE of the Frank and a few miles west of the town of Challis. 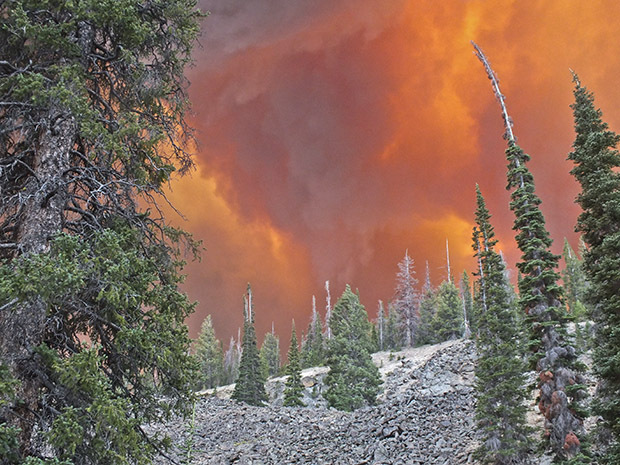 Last summer and early fall, both Challis and Salmon, Idaho suffered intense smoke. Some smoke is now blowing in again, mostly from the Papoose Fire at Salmon and the Lodgepole Fire at Challis. Almost all of Idaho has dropped into drought conditions, and currently there is little prospect of fire quenching rains. Dry thunderstoms are predicted for the weekend of the 27th and 28th. Update 8-3-2013. The Lodgepole Fire grown to over 20,000 acres. From Wildfire Today website: The Union of Concerned Scientists have produced this infographic about how climate change could affect wildfires in the western United States. Thanks Kathleen. If you travel through deep central Idaho, the forest is almost unrecognizable now compared to the turn of the millenium 13 years ago. I am not saying that is for the bad. I am saying it is a transformation of the landscape. Living in the smoke almost every summer is not pleasant. Smart people take the long wildfire season into their work and vacation plans. People moving to the area, Western Montana too, should expect several months of smoky air. The pollution levels might exceed that of the worst dirty cities. Yes yellow and red needles — when a tree is at its most flammable! I drove past where the Ridge Fire is now burning just a month ago. There were a lot of dead trees, but mixed in where green and red and yellow ones. There were also some standing dead burned trees from wildfire a year or two ago. Some it is reburn. I’ve been doing just this the last several years. In 2012, I did not come out until late September. I had planned to rent a cabin in Missoula this summer, but that’s been put off until the fall, and may even be put off permanently for the Seattle area, which doesn’t have the forest fire problem Idaho/Montana does lately, but which also provides fine outdoor recreation and public land. Sadly, as you have said, this is becoming a permanent thing. You just have to plan for it. Visitors will get the best of both worlds by planning trips early in the season and in late fall, while residents are stuck in the haze. I think we can see the Lodgepole Fire, west of Challis is the logical extension of last year’s giant Halstead fire. It would have run all the way to Challis had it not been held at the Yankee Fork of the Salmon River. Now the fire picks up on the east side (and a bit north) of the Yankee Fork. I spent three days exploring the Halstead Fire in late June. It is anything but 190,000 acres of stumps. There many areas in the perimeter than didn’t burn and even more that were just ground fires. Many trees were barely killed. These will now lose their needles and stand there for a long time. Glad to see many areas within the fire perimeter doing well. I have been going to the Stanley area several times a year since 1995 watching it turn browner each year. I can’t believe the whole area hasn’t burned yet and surprised they can get any fire there under control. Good point, Ralph, fire perimeters and the actually areas burned are very different. Most fires leave a mosaic of unburned, lightly burned, and severely burned patches. Its difficult to describe unless you see it first-hand. The burned patches actually help deter the spread of subsequent burns in following years and numerous critters are drawn to the burn sites. Too bad the “let burn” policy is so politicized; its really needed in some fire adapted landscapes. Not that I want anyone’s house to burn. If I understood it correctly, due to lack of funds because of sequester,etc., this year the Forest Service will reduce its efforts to extinguish fires once they escape relatively easy containment. It looks like the Lodgepole fire is starting take off, moving seriously to the east and northeast. Given a windy thunderstorm day, it could reach Challis in that day.